Sponge Brush Tool has no effect in RGBA/32 mode. It works in other colour modes. (Results are different than in AP 1.6.7, but that seems likely to be a (flawed) attempt to maintain perceptual brightness of colours while saturation is changed). There was a change to the Sponge Tool according to the release notes - The Sponge Brush tool now gives more correct / pleasant results. Yes, but the point of this thread is that it now does nothing at all in a RGBA/32 document. My document is in RGB/32—sorry I didn't make that clear. What am I missing? Can you supply a screenshot or screen recording please? I'm a little concerned we might have a regression—made worse by me not seeing or understanding fully what you're seeing. Thank you. I guess I was using the sponge in Saturation mode and you were using it in Vibrance mode. 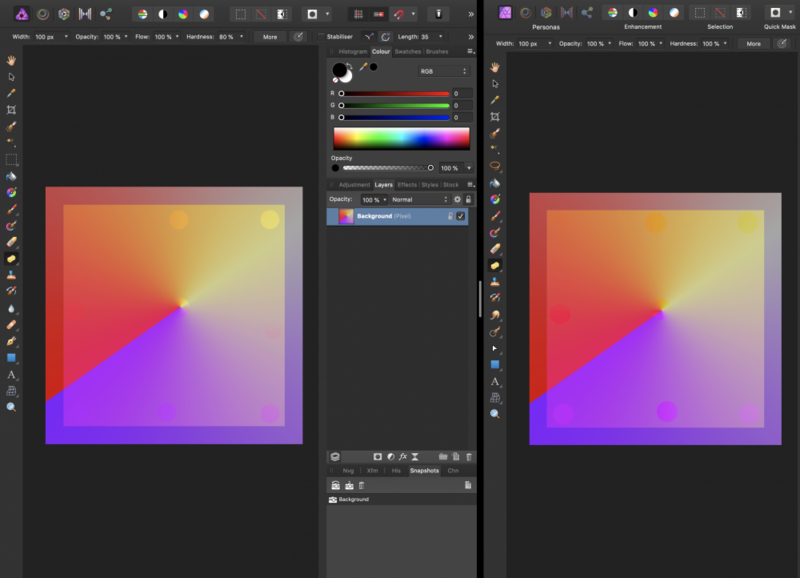 The sponge works in Vibrance mode but not in Saturation mode, just like Vibrance works but Saturation doesn't work in Develop when it is set to output 32 bpc. Let me know if you still need a screenshot/recording.